My first lunch back from vacation had to be from Naya Express, the Lebanese spot on 3rd ave. Before Naya, I’ve never had Lebanese food and now my co-workers and I are addicted. We eat it at least twice a week, not counting late night dinners if we work late. Yes, I’ll admit it, my name is Chubby and I’m a Naya-holic. It must be all those fresh ingredients and choices that keeps us going back. 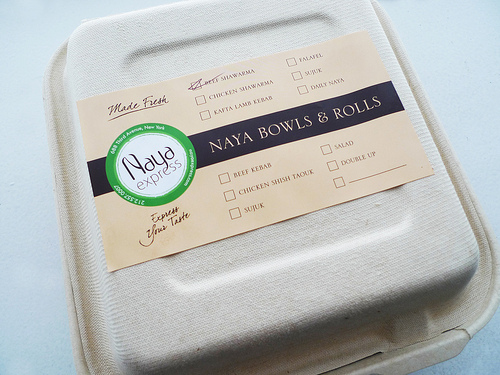 They come in this cool, environmentally friendly boxes. My favorite is their Beef Kabob Salad Bowl. 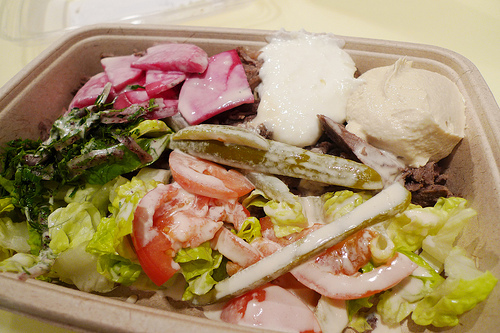 Super fresh, tender juicy pieces of marinated meat, medium well on top of a bed of romaine lettuce and everything on top. All different textures in one bite. You can get juicy diced tomato, creamy humus, a strong garlic whip (consider yourself warned, bring Scope), crunchy turnips, Persian cucumber pickles, parsley-onion mix and jalapeno. Add to that the Spicy green hot sauce and your good to go. A little kick in every bite. 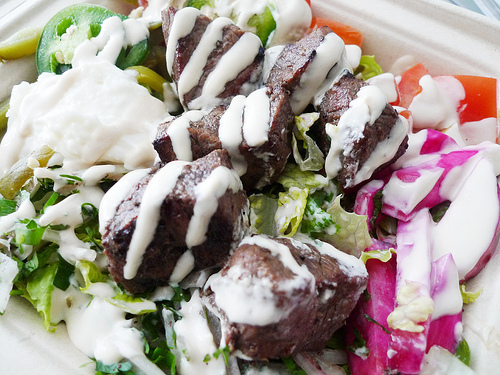 The Beef Shawarma Rice Bowl is also great. 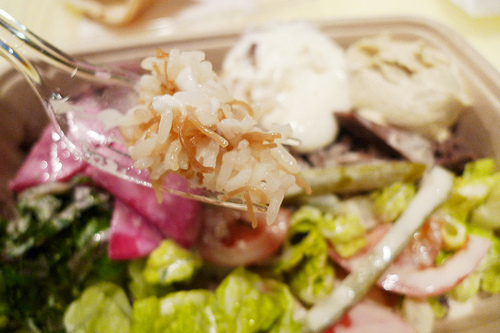 The onion slaw give everything an nice fresh onion flavor, while the tender beef gives a nice bite. And the rest work together in texture. Another great part is their Rice with Vermicelli, as if all the other textures weren’t a mouthful already. It’s so flavorful, nice and soft, you can’t help but forget about carb diets. 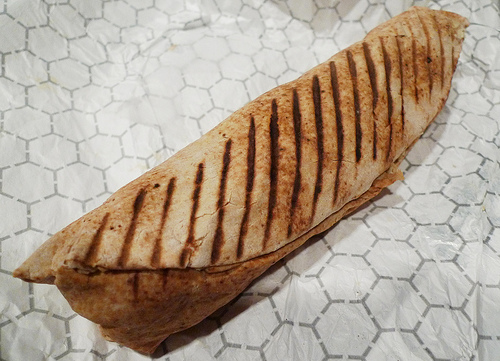 You can also get it all wrapped in a Whole Wheat pita. Sort of like a panini. 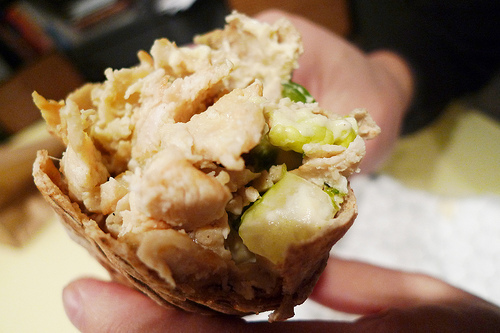 The Chicken Shawarma is also quite good, not dry and flavored well. 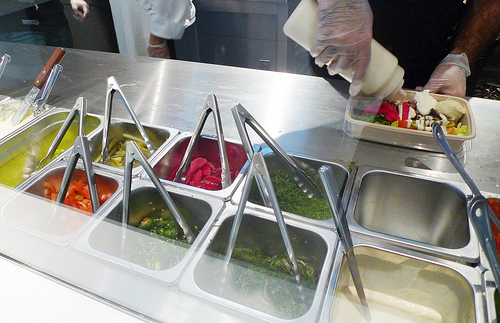 You can wrap all the toppings in it and customize it to you liking. You can wash it all down with their housemade juices. 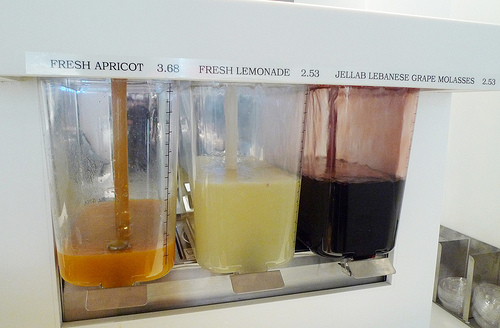 I tried the Fresh Apricot Juice, very sweet and thick for my taste, but they are made with real apricots. Naya also has a restaurant uptown, for now, I’m sticking to this enjoyable addiction. The uptown restaurant is close to my boyfriend's apartment, and we have it on our list, but it keeps losing out to other restaurants at the last minute. From the looks of this, we're going to have to stop ignoring it.